This university offers guidance for accommodation so that foreign students can start a comfortable life from their first day in Japan. The rooms are in apartments about a three-minute-walk from the university and have an environment that is suitable for a student’s studies. The arrangements above are examples. The actual floor plan may be different. About 25,000 yen per person (utilities not included). 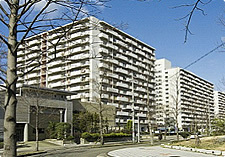 *Rent may be variable, depending on the size of room and floor plan. A gas range, a rice cooker, futon set (quilted Japanese-style mattress laid out on the floor), etc. are provided by the university, and their costs are collected from students after their arrival in Japan.